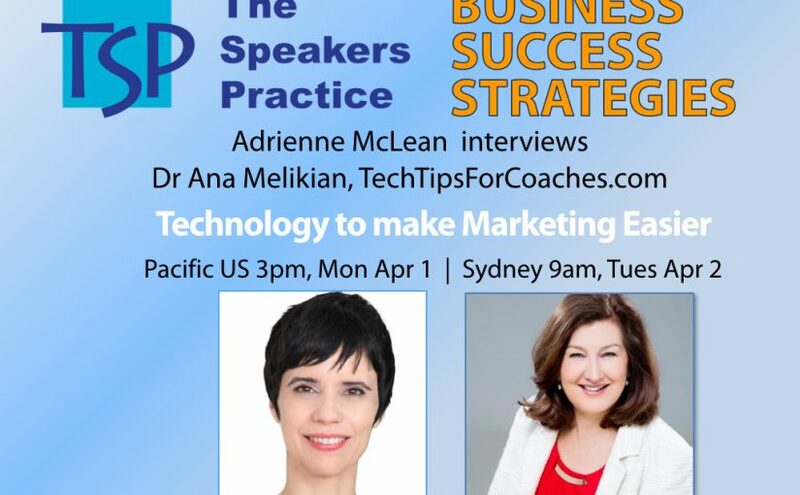 Ana Melikian, the Founder of Tech Tips For Coaches and loves to help business owners achieve their BIG goals! Ana has a Phd in Psychology and is passionate about helping purpose driven, creative entrepreneurs with online marketing and understands the importance of working on mindsets in order to succeed. hip site designed to help coaches, consultants, trainers, and speakers to navigate the online world and market their services online with ease and joy! 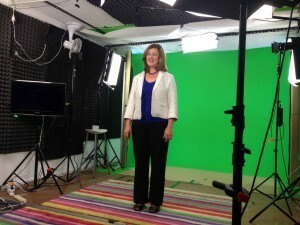 The topic of our interview today is “Technology to make Marketing Easier ! ”. There are so many online marketing tools – where do businesses start? Which is your favourite CRM and Email Management system and why? What are some of the things to watch out for when choosing online platforms? What are some other business tools that are essential for a business today? What is a Business strategy that you recommend? 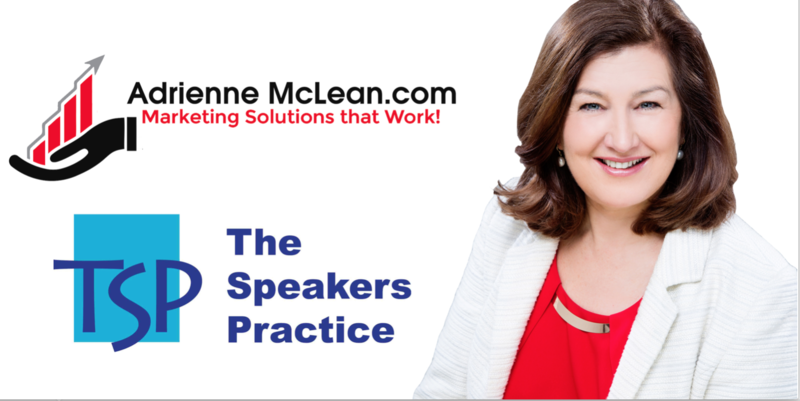 Adrienne McLean DTM , The Speakers Practice – helping clients with business development. 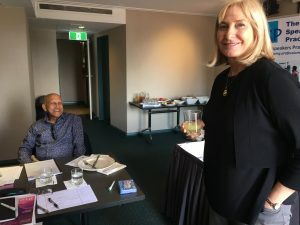 Adrienne empowers Business owners to implement a powerful business building system to get more clients & communication skills to connect with impact. 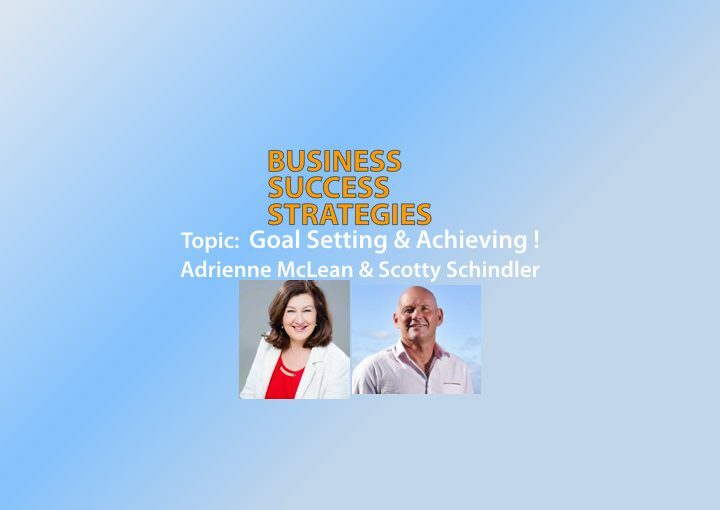 Thanks for joining us for this Business Success Strategies Interview . The aim of this 30 minute interview is to find out from highly successful experts approaches for marketing & growing a business. It’s wonderful today to have Scotty Schindler join us today. Scotty Schindler is today recognised among Australia’s leading entrepreneurs. After three decades of hard work day in and day out in his business career, Scott retired in 2017 at 46 years of age and immediately turned his attention towards service of others in business. Scott has an insight built on real and enduring experience acquired over three decades in business, Scott is renowned in Australia and beyond for his thought leadership. 1. Many people find it easy to set goals but find it difficult to achieve them. Is there an approach to setting goals so they are achievable? 2. 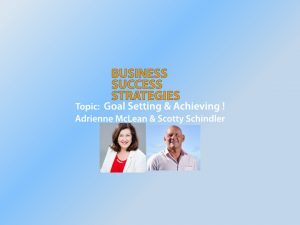 Is it a good idea to have lots of goals or just set a few? Does setting annual, 3 year, 5 year etc goals work? 3. It gets easy to get roadblocks in the process of trying to achieve a goal. What’s your advice about handling roadblocks? 4. What’s your approach to actually focusing on a goal and achieving it? 5. What is a Business strategy that you recommend? 6. Tell us about your business. Building on-line communities is important now. Connecting with people is vital for building trust and connections. 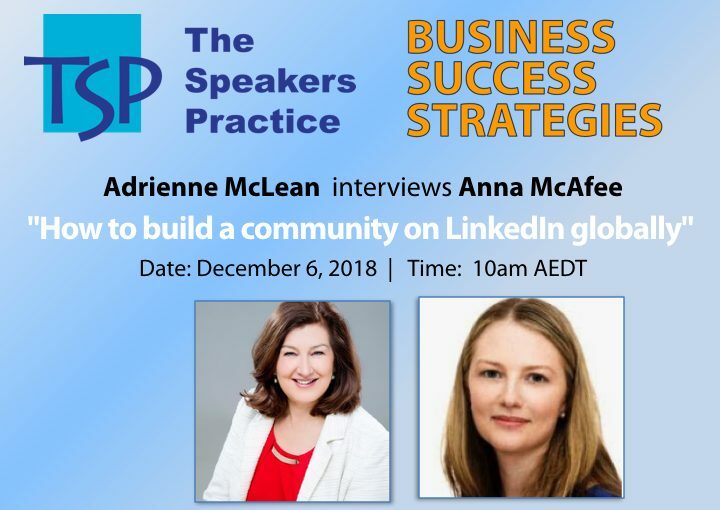 Anna McAfee, Co-Founder of LinkedIn Local really discusses the importance of this and how the LinkedIn Local community has grown internationally. There are some gems of information in this interview. The special part is Anna’s advice on her most recommended business success strategy. Anna has some really valuable advice. Here’s the full interview – takes just on 30 mins. Enjoy! 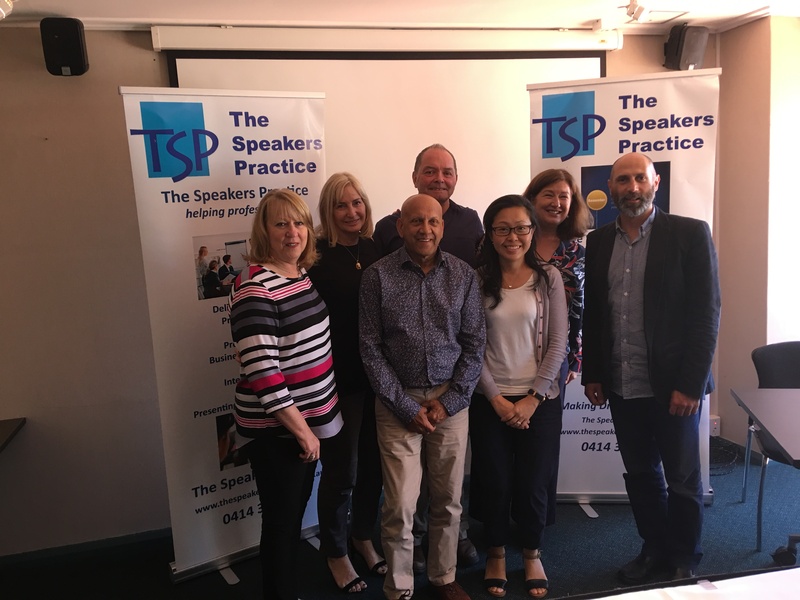 Adrienne McLean helps professionals to get more clients, move forward and build confidence to get the sales flowing in with developing presentation skills, building confidence to speak to camera and work on business development ie marketing & sales. 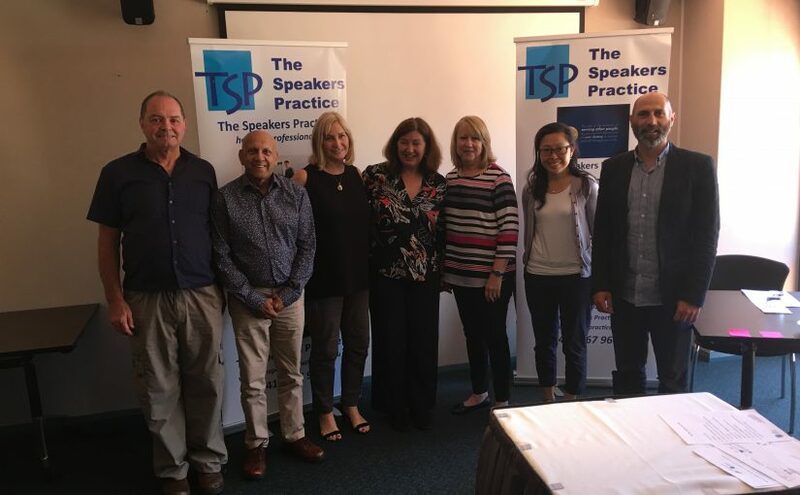 Ring Adrienne McLean on 0414 367 960 or email on adrienne@thespeakerspractice.com.au for more details. 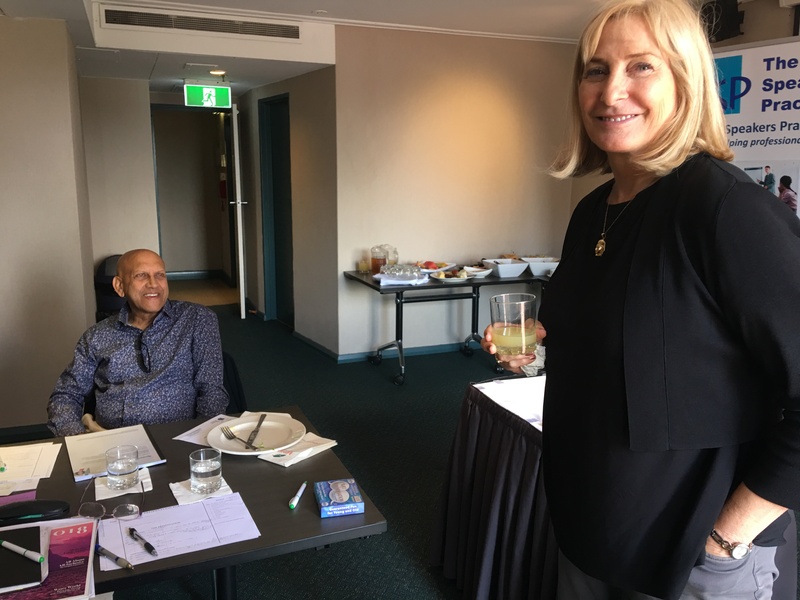 To the attendees of one of the biggest, annual networking events in Sydney, a questionaire was sent out to see what topics and issues they would like to have addressed either at this networking event or at other workshops etc. Over 70% of the respondents detailed that they struggled with their marketing and would like more information on that business topic. So getting more clients and understanding what needs to be done when going through the business development process to realise the sale is a challenge for many businesses in todays challenging world. These are the business building activities that will help grow a business – marketing, having a digital presence, sales and mindset. The challenges faced by businesses with implementing these business activities are real. The second important activity is to have your marketing and sales systematised to make these activities more efficient. This will assist with getting sales faster. If you have questions, examples or comments, then please let us know. Our programs are designed to help Service Professionals to get more clients, we are here to assist and we encourage you to comment. 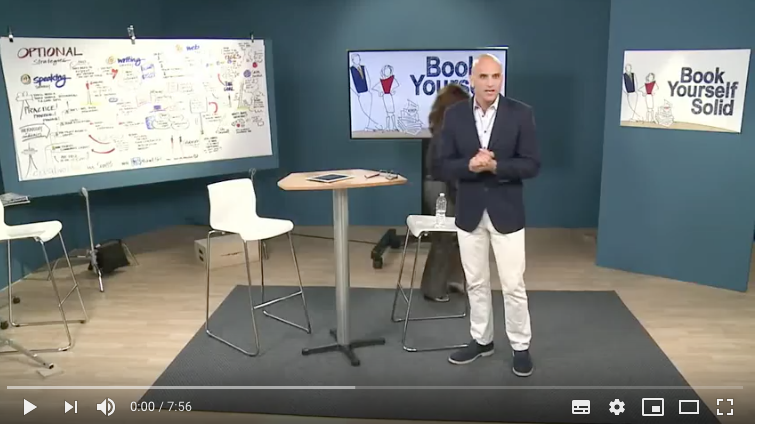 Here is a well worthwhile video to watch with Michael Port, the author of the business building system BookYourselfSolid®. 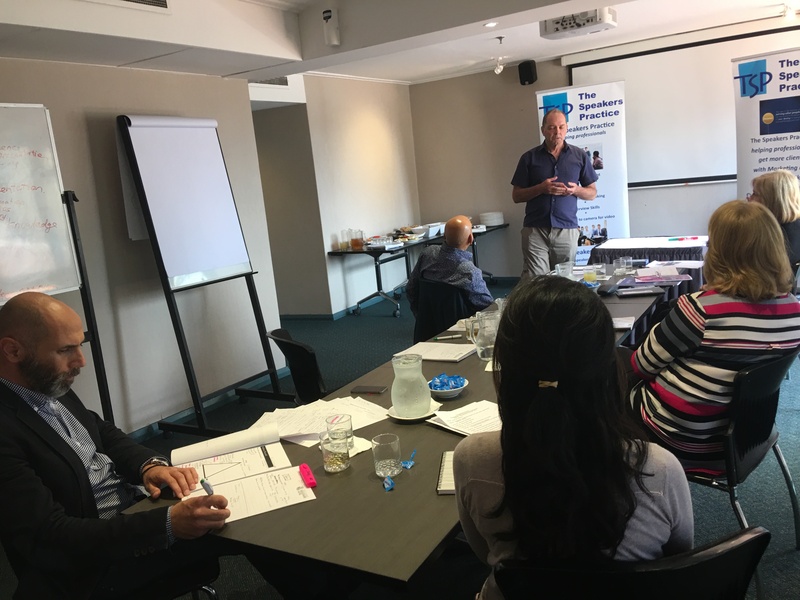 Michael is delivering a 7 minute overview of how the BookYourselfSolid® system works and the segments that all businesses need to address to be booked solid. 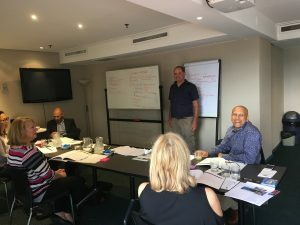 If you have a questions about business development and marketing – for instance about Target Market or about Building Trust and Credibility or working with Ideal Clients or how to have a Sales conversation, what marketing activities are important – we have a proven approach to help you go from having no leads in your pipeline to being fully booked. We can help you get to the next level. Just as one example – a Customer Relationship Management tool (CRM) can keep all your clients details in one place and you can easily get in contact with your clients. 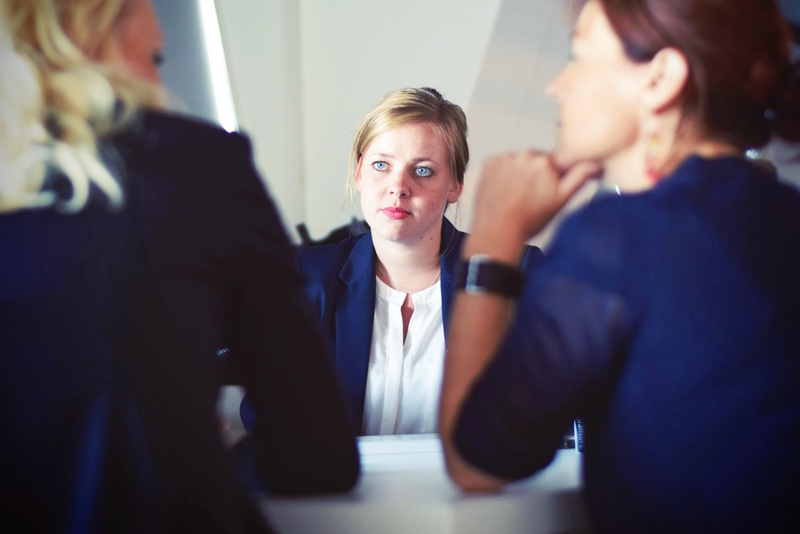 You might be surprised how infrequently this tool is used ,however, it is a very valuable way to building trust and credibility and those connections with your clients that are so important. We can help you implement a CRM system that fits your budget. 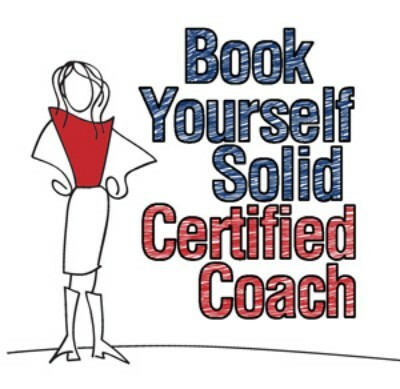 Being the BookedYourselfSolid® Certified Coach here in Australia, we have available all the tools, exercises and building blocks to help businesses grow. The BookYourselfSolid® business building system puts a structure and framework to work by that systematically helps to grow a business. Just email to find out more details. 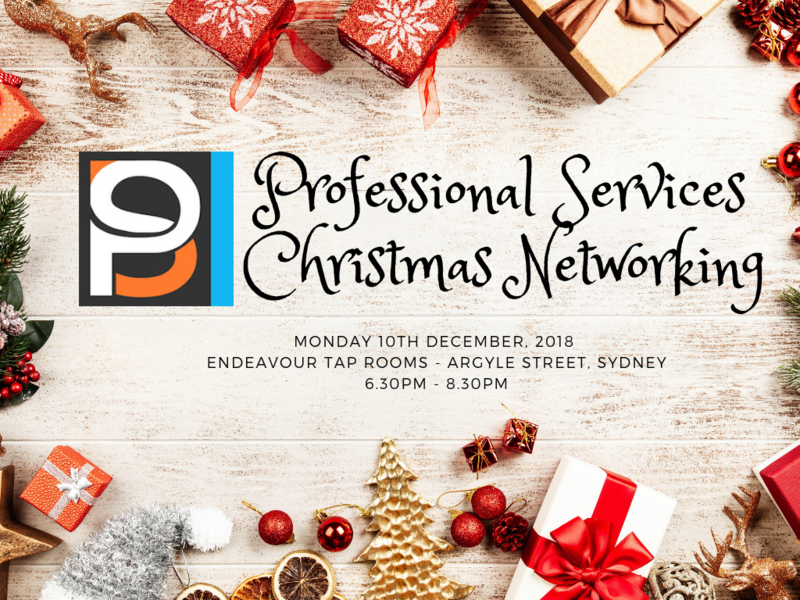 Connect and celebrate with Service Professionals on Monday 10th December from 6.30pm – 8.30pm ! Share & network, bring along promotional items to hand out and share about the years triumphs. This is an opportunity to meet and connect with like – minded professionals at a fabulous venue to look back over the year and look forward to the next one (not too far away!). The Endeavour Tap rooms are putting on a delicious meal for you to enjoy. 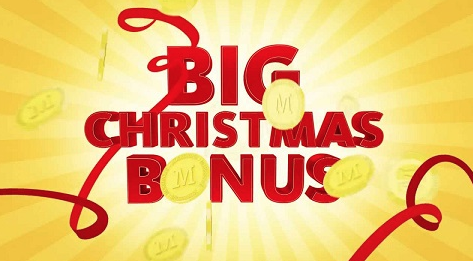 Plus – you get two special BONUSES to really assist with making 2019 a very successful year! 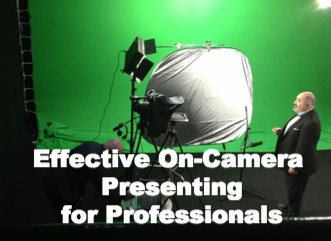 Check out the Effective On-Camera Presenting program. Online – Professional Services Marketing Conference 2018 – there are 6 hours of presentations full of really valuable information to help you with marketing, digital marketing, sales and mindset. Finally, I have a question for you – what are your top 5 marketing questions? Just email and let me know, these questions can be answered in future issues. By scheduling in regular marketing, this will help with keeping your business front of mind with your prospects. If your business is front of mind, when the time is right, the prospect will discuss with you their needs & business can be done. Have you got a regular process to follow to implement your marketing regularly? 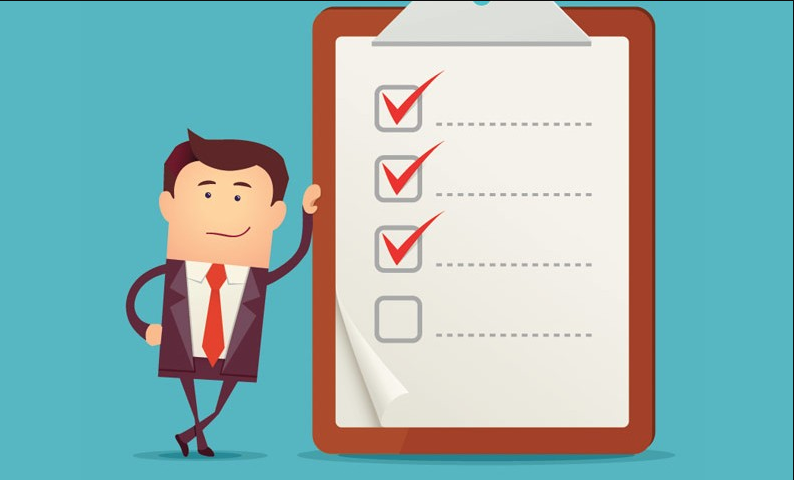 Here’s a checklist to do to consider your current marketing efforts. It’s a bit like doing an audit – checking what is currently done and what needs work on. Perhaps if you want some help – schedule in a time with me for a free 30 minute phone call to discuss. Here to help – Adrienne McLean – The Speakers Practice. 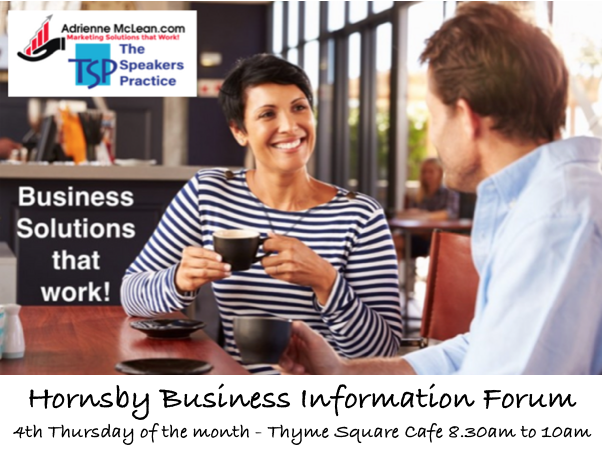 BooK here – 30 min Consultation – Free! Perhaps if you want some help – schedule in a time with me for a free 30 minute phone call to discuss. 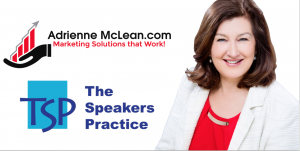 Here to help – Adrienne McLean – The Speakers Practice.